The frugal professional's best choice! Blick Professional Acrylic Gesso offers maximum opacity, tooth, adhesion, and water-resistance, plus the highest concentration of titanium pigment for the brightest white ground. Apply it to raw canvas, wood, hardboard, paper, and other porous surfaces as a preparatory ground for oil or acrylic painting. The 100% pure acrylic polymer formula has a thick, heavy-bodied viscosity that covers in one coat and holds brushstrokes if desired. You can tint it to any shade using acrylic colors. Non-toxic and lead-free, it dries to a flat, flexible film that will not yellow or crack. 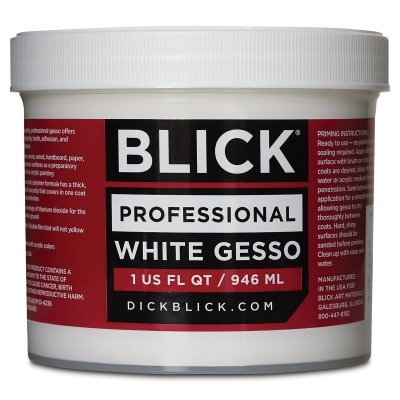 Blick Professional Acrylic Gesso is ready to use — no preliminary sizing or sealing is required. 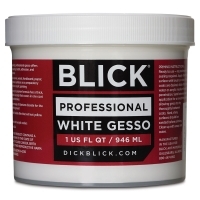 Apply it directly to a clean surface with a brush or roller. 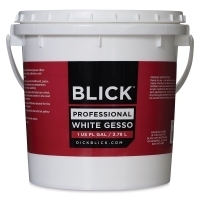 For best results, dilute the first coat with water or acrylic medium for the best surface penetration. Sand between each application for a smoother ground, allowing gesso to dry thoroughly between coats. Hard, shiny surfaces should be sanded before priming. Clean up with soap and water.